Mike Bossley, in his research boat, keeping an eye on Wave. 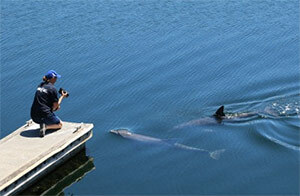 Dr Mike Bossley’s thirty years of dedicated, non-invasive research of the Port River dolphins started with Billie swimming with local race horses. Observing individual dolphins, both resident and regular visitors, Mike looks out for identification marks, what activities and traits are being performed, their social structures, which areas of the Adelaide Dolphin Sanctuary are favoured home ranges, and the health of the population, and the various threats to that health. It was the concern for that health that motivated Mike to lobby for the establishment of the Adelaide Dolphin Sanctuary. Another aspect of his research is to try and understand dolphin culture, and how behaviours change and what influences that change. Tail walking is a phenomenon unique to the Adelaide Dolphin Sanctuary, brought to the Port River by Billie nearly thirty years ago and since adopted by a number of the other wild dolphins, including through generations. Different dolphins have a variety of favourite fishing techniques, including herding their prey against underwater wire meshing or ship hulls. Dr Bossley recently released a scientific paper highlighting the correlation between improved water quality in the river and an increase in the resident dolphin population. Billie first became famous when she started swimming with race horses exercising in the Port River. This became a regular feature, and it was thought that, at two years of age and with no mother in sight, that she was an orphan and liked the company of the horses and, occasionally, the race trainer’s dog. 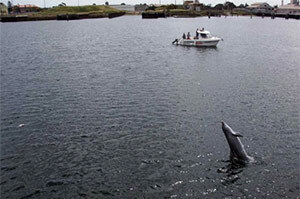 A couple of years later, Billie went missing at the same time as a dolphin was trapped behind the Patawolonga River lock gates, about 25 kms south of the Port River. 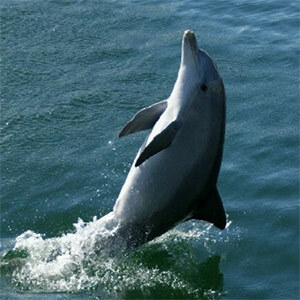 The dolphin was captured and interned in a small dolphinarium for a few weeks before being returned to the sea. 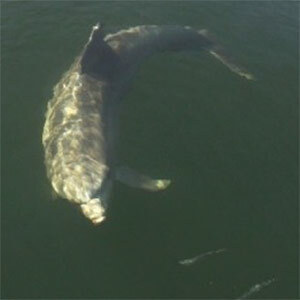 Billie re-appeared in the Port River and Dr Mike Bossley was able to determine that the two dolphins were the same. Shortly afterwards, Billie amazed watchers by performing tail walks in the River, a skill she must have learned while observing the captive dolphins in the dolphinarium. This is the first time it had been seen in the wild. Other dolphins have learnt the feat and it has been passed down through generations, with Billie’s friend Wave and her calf Ripple being regular performers. Sadly, Billie left us in 2009.